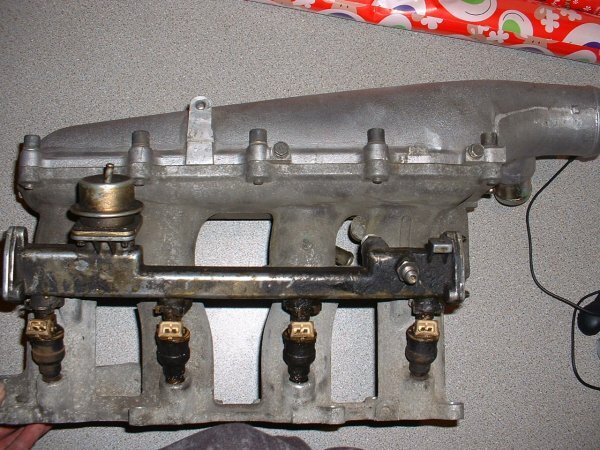 ime wonting to mod a pulsar gtir inlet manafold to fit a c20let but instead of cutting the let/xe runners i wont to do away with it and machine something up from scratch. this will mean making some injector lugs for each runner. is this ok or do the injectors need to be angled etc into the ports to close tolerences? lots of £ and not sure about the clearences. also the pulsar mod idea i think has been binned as the runners didnt marry up very well. by making a one off plenuim to head part though you could loose the angles but its only the injectors that ime not sure about. Alot of hassle mate, and alot of work to get them to flow match. This is what we will call "Road" use inlet which has a small plenum on top and is shown with a 80mm billet throttle body. This is what we will call "Drag" use inlet with alot larger plenum ontop and shown with a 100mm billet throttle body. been reading lots about these mate and your work looks to be quality stuff. saw that the pulsar ones got binned but i was thinking that if you made a one off bit instead of using part of the xe manafold you could effectively determend the clearence to the bulkhead that way. although your custom ones are very nice ime looking to do something myself rather than buy bolt on parts as it were. i guess the injector posistioning is (about there!) sort of tolerences and not critical? also did you make the trumpets using feature cam?